Although most companies now utilize social media for sales and marketing campaigns, many forget that social media can be used for better customer service. And that’s a shame because every support inquiry is an opportunity to build a positive relationship with a customer. And most customers already know this. According to a recent survey by Oracle Corporation, 81% of customers who use Twitter expect a same-day response to tweeted support inquiries. Is your company up to speed? 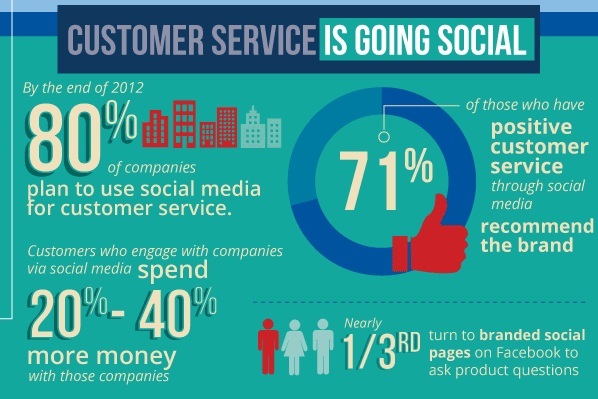 If not, you may be wondering why social is a better channel for customer support than a hotline or a knowledge base. We believe that listening is the first stage of a social media plan. Regardless whether customers need help with a specific product or service issues, or are discussing these issues more broadly, organizations should be investing their time in listening and learning from customer sentiment as a way to gain insight into areas where improvements need to be made. As an example of how one successful company listens to its’ customers, let’s take Taylor Guitars. Dave Carroll, a Canadian musician, found his guitar damaged after getting off a United Airlines flight. He determined that due to reckless handling by the airline porters, his guitar had become impaired. United Airlines however denied the claim, so Dave used social media to voice his opinions. In short, they offered to repair the guitar by joining in with Dave’s now extremely popular social media sourced outburst, thereby greatly promoting both their services as well as their product range. Indeed, this example goes beyond merely listening to your customer base, but it highlights one aspect of how listening to your customers on social media can in fact reap considerable rewards. To be able to listen to what customers need, companies must have a presence where their customers are speaking. According to a report by NM Incite, almost half of the amount of people who use social media (47 percent to be exact), also use company customer service via social media channels. Having multiple social channels available for social care purposes actually helps companies to utilize their resources rather more effectively. Furthermore, according to a report by the Aberdeen Group companies that provide customer support using social media channels achieve superior gains in net profit 7.7 percent vs 2.9 percent. Richard Branson yes, also known for Virgin Group, with core areas in entertainment, travel, financial services, lifestyle, to name but the few. There’s no question that Branson is very much a forerunner within the social media space among fellow CEOs. He goes as far as to contribute self-generated content which helps to enhance the experience of not only his followers but also Virgin’s clients. Branson has just shy of 6 million Google+ followers, almost 4 million Twitter followers, and close to 3.5 million followers on his LinkedIn blog. Furthermore, he also takes the time to follow others and makes the effort to frequently tweet both about business matters and on a variety of topics. This level of self-propelled’ engagement not only sets him apart from all other social CEOs, but also inevitably adds greatly to his personal and his company’s brand. Quick responses are generally achieved with respect to customer requests and complaints when companies listen to their customer base. Unanswered complaints have a habit of going viral, as lots of companies are now aware of by learning the hard way, and that can bring about a lot of irreparable damage to any company’s brand. 19% percent of those who received no response would be intent on still recommending the same brand. Which company would you rather be? As an example of an excellent company response to customer dissatisfaction, let’s take JetBlue, the low-cost airline. There’s no getting away from it airline delays commonly occur, and invariably cause a whole lot of customer frustration when they do. And when they do happen, people tend not to shy away from vocalizing their feelings. Accepting this scenario as commonplace, @JetBlue fully appreciate their responsibility for continuing customer loyalty, and as such, not only are they happy to engage with satisfied customers, but they also try their utmost to help out when frustrations are growing due to delayed flights. Here’s an example Twitter thread of JetBlue reaching out to a frustrated customer within the hour. @Makdousa We understand your frustration and know this is a great inconvenience, we’re working fast to return your bag to you. It’s a fact that social media is now being used more in terms of consumers making complaints and asking for help. Organizations that wish to be involved with consumer feedback will have to recognize that social media channels are not only excellent places for generating sales, but also for learning far more about their customer base and what it is they really want. What great examples have you seen brands handle customer service? Have you had a positive or negative experience with companies on social media? Did we miss any good reasons above? Let us know in the comments below!